The Karolinka’s Kluttered Cupboard (199 L$) is FINALLY OUT FOR SALE, both at our inworld store, as well as on the Second Life Marketplace. I decided to remake the sculpt map for the base unit, to make it more closely resemble the real life piece of furniture that belonged to my grandmother (after whom it is named). It is stuffed full of all sorts of goodies, and there is even room for your own stuff in the wicker baskets – hope it is fun to play with! The matching Karolinka’s Kluttered CORNER Cupboard is also out for sale at our inworld store and the SL Marketplace. I released this item just the other day – it was specifically made for the Designers Showcase, which is currently closed due to a change in management. I have decided to provide it at the same PROMO price of 99 L$ at my inworld store. -Hanaya- will be participating in the following upcoming hunts. I will also be creating themed one-of a kind yummies for the Atooly Theme Market. Next week’s theme is the 80s … that promises to be fun, since it is my fave decade 🙂 More info later in the week! This entry was posted in Product Announcements on January 24, 2011 by moriko. As January slowly comes to an end, many of us like to stay cuddled up inside our homes. For me, cozy surroundings are just perfect for this time of year. I am comforted by cluttered, shabby furniture with lots of reminders of days gone by. Part of the -Hanaya- Kluttered series, Karolinka’s Kluttered Corner Cupboard is available at a special PROMO price for the next 3 weeks at the Designers Showcase location. The cupboard is an original sculpt made by moi :-), and is stuffed full of goodies that are all mod/copy, so you can use them to decorate all over your house. I even left space for you to put your own stuff – just open the bottom cupboard doors. While you are at the Designers Showcase, please check out stuff from other awesome creators – all items there are 100 L$ or less! I popped open a heart-shaped trinket box, and planted an adorable orchid in it. Mod/copy and only 12 prims! And not a single flat texture in sight. If you want to send as gift, please buy at our webstore on the Second Life Marketplace. By now, you guys might know I like stuff made out of branches and twigs, right? I glued some branches together and strung up some puffy hearts for a home decoration just right for Valentine’s Day. Isn’t it yummy? In real life, I am a nature and gardening nut, and this time of year I start to plan for spring. I comb through seed catalogues, looking for that perfect heritage seed, I make plans to revitalize my perennial borders, and get ready to order live plants from my fave online shops. This entry was posted in Product Announcements on January 22, 2011 by moriko. Lots to tell you, so please grab a coffee or a cup of tea, and read on if you have a minute. First, four new flower arrangements are out in the shop (two of them for Valentine’s Day), as well as on the SL Marketplace. My personal fave, the Birch Basket with Orchids, features a delicately veined and coloured moth orchid from Arctic Greenhouse, set in a rustic birch basket with twig handles. Copy/Mod permissions, 99 L$. If you wish to buy as gift, please do so on the SL Marketplace. 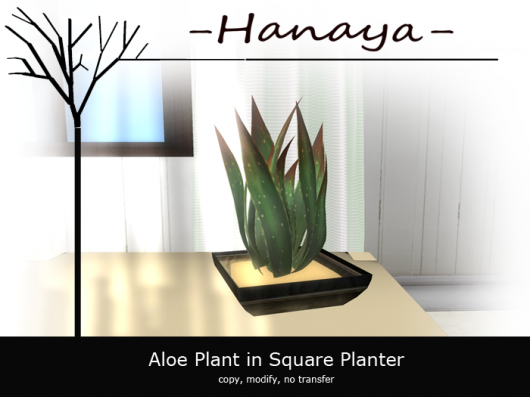 PROMO priced (49 L$) and only 4 prims, the Aloe Plant in Square Planter is also Copy/Mod – perfect for a touch of greenery for your home or business. Yeah, I love orchids so I planted one in an open gift box, added some luscious red heart balloons and wrapped it in love. Mod/Transfer permissions, 99 L$. So sweet, it might set your teeth on edge, or make your sweetie’s heart melt :p. Picture an arrangement with a heart shaped bamboo of the lucky variety, interspersed with happy, glowy, heart-shaped balloons. Set it in a ceramic heart relief pot, decorated with a fat fabric bow and a translucent butterfly. All ready for gifting @ 99 L$ – transfer permissions only. A new Gatcha! is stuffed full of yummy, decorative Rooster Plates and Bowls – 15 L$ Transfer/No Copy/No Mod. Trade with friends and collect them all. Or buy for 25 L$ each from the wall display beside the Gatcha. A new subscribo gift should be out in the next day or two, so if you are subscribed, keep an eye out please, and have a great week! This entry was posted in Freebies and Gifts, Product Announcements on January 17, 2011 by moriko. Yay! We are participating in our first ever hunt, the There’s No Place Like Home Hunt, organized by Hioh Jinx of Jinxed! Hunts. The hunt, featuring 133 stores, starts this Saturday (January 15th) and runs until February 15th, 2011. I have been dying to try out a new tool to make sculpties that I got for Christmas, so I decided to create a tin man sculpture especially for this hunt – the Tin Man. It comes complete with a gently beating heart (thanks to hubby for the script), and has sweet little sparrows perching on arms and shoulders. 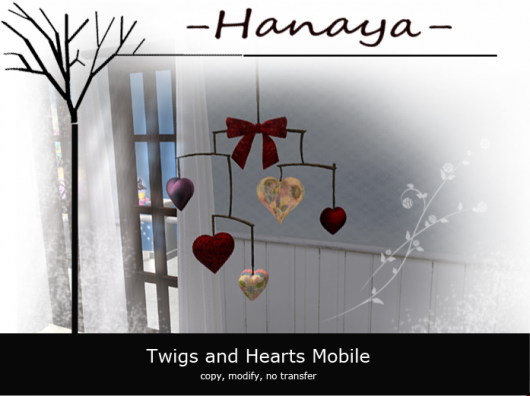 This entry was posted in Freebies and Gifts, News on January 13, 2011 by moriko. To continue the January theme of light and airy colours, a new fatpack of gift boxes with yummy embellishments is now available at the -Hanaya- inworld store, as well as on the Second Life Marketplace. The fatpack includes 15 no copy boxes – 3 of each type of gift box – as you can see in the above pic. They are mod/transfer, so you can stuff your own gift inside and pass to your fave SL person. Suitable for birthdays, weddings or girlie gifts. A freebie version of the boxes for (for decoration) in “copy, no mod/no transfer” permissions is also available inworld on our Up for Grabs table. This entry was posted in Freebies and Gifts, News, Product Announcements on January 10, 2011 by moriko. If you missed the gift sent out by our subscribo, please pop by the store and click on the History on the subscribo machine to get yours. It is a copy, no mod, no transfer fully sculpted bamboo, featuring the 2011 Charity Bunny by F.E. Energy. We hope it brings you luck and enhances your living spaces. 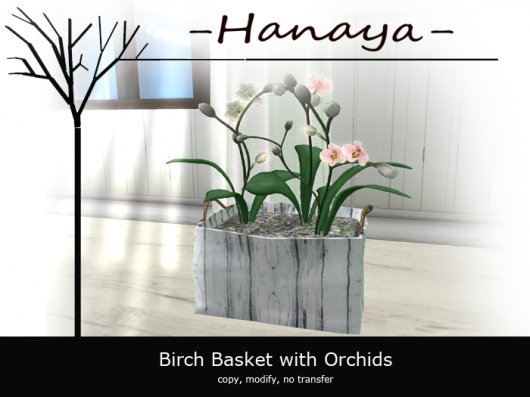 You will be seeing more bamboo creations from -Hanaya- in the coming weeks, both in flower arrangements and pots, as well as for outdoor planting use in various heights and prim counts. This entry was posted in Freebies and Gifts on January 8, 2011 by moriko. To many of us, January is a time for cleansing, rebirth, and a crisp fresh look to things. The Winter Leaves casual furniture collection, with its clean lines brings just that. 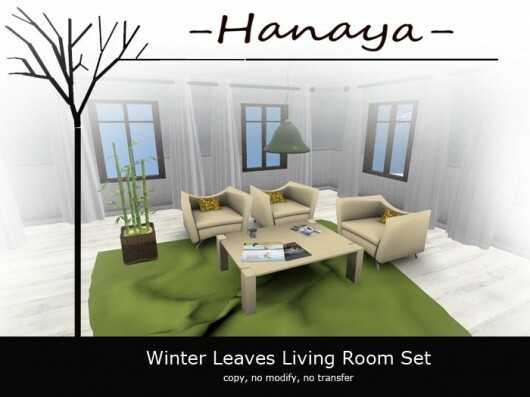 The casual look of the Winter Leaves Living Room Set ( 299 L$ ), with its scrunchy-messy rug, squishy chairs with a unisex pose and scattered magazines brings a zen-like feel to your home or business. A pendant lamp provides a soft light, while our newest bamboo plant in a wicker basket completes the look. A must for every rug, a 3-position pose script is built in, so you can model your clothing and accessories without having to drag out a pose stand. Buy at our webstore on the Second Life Marketplace. 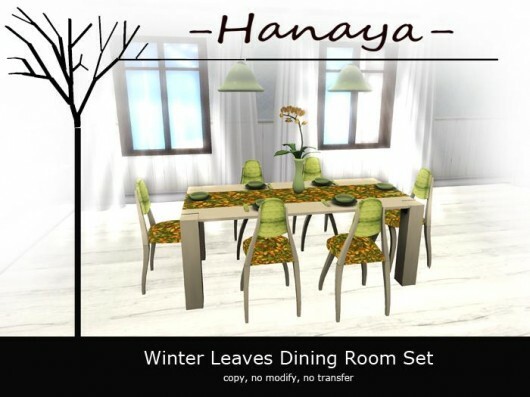 The Winter Leaves Dining Room Set ( 299 L$ ) features a table set for 6 with upholstered chairs and eating animations for male and female avies by Bits and Bobs. Click on the matching table cloth runner to receive a dinner knife and fork. The table is graced by a moth orchid in a milk-glass vase. Two pendant lamps (provided in mod/copy permission so you can resize them as needed), include a soft light via on/off switch. Buy the packaged set of the Living Room and Dining Room Sets, and save 25%. The PROMO inworld price of 450 L$ is not available on the SL Marketplace. If you wish to buy as gift, please IM me with the particulars. This entry was posted in Product Announcements on January 6, 2011 by moriko. -Hanaya- is thrilled to be part of the brand new Designers Showcase at Glam Island. The showcase venue, organized and hosted by Annette Cyberstar (owner of Glam!) at her main store sim, currently features one special item from more than 20 awesome Second Life creators. All items in the showcase are 100 L$ or less and there are some awesome deals. 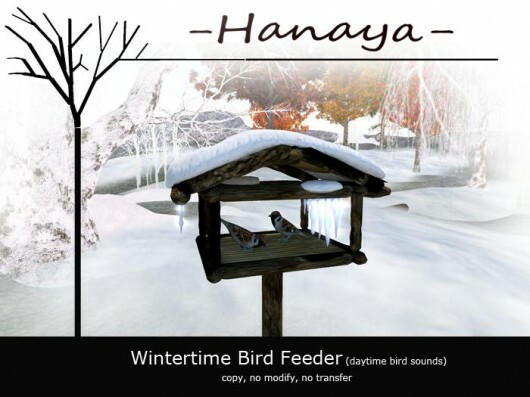 A new release from -Hanaya-, the Wintertime Bird Feeder, is only available at the Designers Showcase. The 14 prim feeder features 2 adorable sparrows, includes daytime bird sounds, and is packaged in two linksets (with and without a snowbase). Also included are 2 copyable sparrows – one sitting pretty, and one pecking on bird seed, so you can rez out as many as you wish all year long. This entry was posted in News, Product Announcements on January 5, 2011 by moriko. It is almost time to reclaim your space, put away all the Christmas stuff and get ready for the crisp, fresh look of the New Year. You need the Oh So Tired Tree Play Set. The concept for this playset is based on my own habit of reading reading reading to the exclusion of all else, especially housework, and other stuff that needs doing. So pull a few ornaments off the tired old Christmas tree, bung them into the box, then snuggle down with your better half to enjoy a few more hours with your tree, while reading all those new books you got for Christmas. Both animations are long playing loops and are suitable to either male or female avatars. The Oh So Tired Tree Play Set is boxed as a linkset (only 18 prims), as well as separate components, so that you can use the pillows and book long after the poor little tree has turned to mulch. Fully sculpted with loving detail from our shop to your home or business. This entry was posted in Product Announcements on January 1, 2011 by moriko. Moriko Inshan and her team are thrilled to announce a new web presence for -Hanaya- Yummy Collectibles & Art Gallery. Dedicated to bringing quality sculpted flower arrangements, collectibles and decor for home, business and outdoor environments in Second Life, the store offers an eclectic mix of products suitable for every budget. 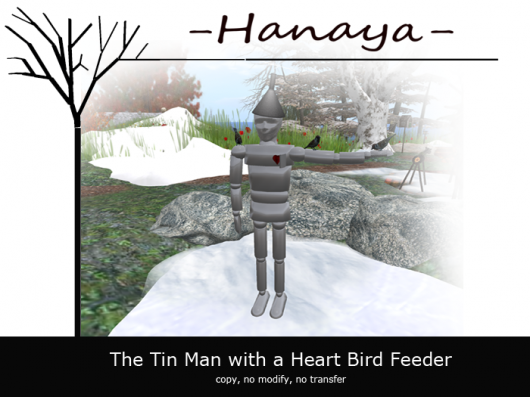 Visit the inworld store today, or shop on-line at the -Hanaya- Second Life Marketplace webstore. The store, conceived in late 2009, began to make its presence known in November 2010. This entry was posted in News on January 1, 2011 by moriko.